Bispecific antibodies (bsAbs) represent a relatively new and clinically validated class of therapeutic molecules. Three bsAbs have been approved for different therapeutic indications, and over 50 bsAbs are currently in clinical development. Scientists have been particularly inventive in creating solutions to the fundamental problem of combining two antibody specificities into one molecule, with protein engineering playing a significant role in bsAb development. So many solutions have been devised that therapeutic developers may choose from a vast array of bsAb formats. Different bsAb formats have distinct characteristics and support unique modes of action. When choosing or working within bsAb formats, developers must consider how these formats will influence factors such as biology and therapeutic activity. Other factors that must be considered are developability, manufacturability, and stability. All these factors influence the progression of bsAbs to the clinic. The first generation of bsAbs was developed through methods including chemical cross-linking or from hybridomas. Currently, bsAbs are generated by chemical conjugation with cross-linkers, by somatic fusion of two hybridoma lines (quadroma), and by genetic (protein/cell) engineering. More recently, bsAb developers have created such antibodies with Fc regions. These bsAbs can mediate Fc effector functions, such as antibody-dependent cellular cytotoxicity and complement-dependent cytotoxicity and have the half-lives of normal IgGs. Alternatively, bsAbs without the Fc region (bispecific fragments) rely solely on their antigen-binding capacity for carrying out therapeutic activity. Due to their smaller size, these fragments have better solid-tumor penetration rates, but they are also rapidly cleared from circulation leading to shorter in vivo half-lives. Now scientists can adjust the size, valency, flexibility, and half-life of bsAbs to suit the application. Last year, Roots Analysis issued a report entitled, “Bispecific Antibody Therapeutics Market (3rd Edition), 2017–2030.” The report observed that that about 11 technology platforms are currently in extensive use. These include Dual Affinity Re-targeting (DART) (MacroGenics), Bispecific T-cell Engager (BiTE) (Amgen), CrossMAb (Roche), Nanobody (Ablynx), and XmAb (Xencor). Many bsAb candidates are BiTE antibodies that have been developed such that one antigen-binding site is directed against the CD3 receptor on cytotoxic T lymphocytes, while the other antigen-binding site is directed against specific tumor-cell antigens (such as CD19, CD20, CD33, CD123, HER2, epithelial cell adhesion molecule [EpCAM], BCMA, CEA, and others). The ability to bind two or more unique epitopes gives bsAbs greater versatility than conventional mAbs because they can target multiple pathways, cross-link cell surface receptors, pretarget oncological epitope-containing cell types, deliver therapeutics with reduced off-target damage, and redirect FcR- and non-FcR-expressing immune cells to kill target cells. Bispecifics are estimated to capture 58% of the market by 2023. But by 2030, molecules belonging to other product classes having different mechanisms of action, such as blocking cytokines, dual targeting, and half-life extension, are collectively projected to capture almost 75% of the market, with highly lucrative deals emerging between pharma and biotech companies. Xencor and Novartis announced in 2016 that Novartis will codevelop two of Xencor’s T-cell-engaging XmAb bsAbs targeting acute myeloid leukemia and B-cell malignancies as part of a broader collaboration potentially generating up to up $150 million up front for Xencor. Moreover, last year, U.K.-based F-star and Germany’s Merck KGaA established a strategic collaboration to develop and commercialize five of F-star’s bispecific immuno-oncology antibodies (mAb2™). The deal, which is potentially worth $1.13 billion, includes F-star’s lead preclinical asset, FS118, and four additional bsAbs selected from F-star’s platform. FS118 targets lymphocyte activation gene 3 (LAG-3) and programmed death-ligand 1 (PD-L1). To date, such bi- or tri-targeted antibodies have received marketing approval including blinatumumab (Blincyto), Amgen’s anti-CD19/CD3 bispecific T-cell BiTE approved by the FDA in 2015 for the treatment of refractory B-cell acute lymphoblastic leukemia. And on March 29, 2018, the agency granted accelerated approval to Blincyto for the treatment of adult and pediatric patients with B-cell precursor acute lymphoblastic leukemia in first or second complete remission with minimal residual disease greater than or equal to 0.1%. Amgen acquired the antibody through its $1.16-billion cash acquisition of Micromet. The deal provided Amgen with both a cancer immunotherapy based on the bsAb fragment blinatumumab and the underlying technology that produced it. Blinatumumab is a fusion protein made up of the variable regions of two single-chain, variable fragments linked by a nonimmunogenic five-amino-acid chain. The antibody binds to CD19 highly expressed on the surface of cells of B-lineage origin and CD3 expressed on the surface of T cells, forming a “synapse” between the cells, according to the company’s website. Once the synapse is formed, blinatumumab leads to upregulation of cell-adhesion molecules and the production of cytolytic proteins that destroy the tumor cells. Despite great advances in antibody design, bispecifics pose production challenges distinct from developing and manufacturing monoclonals, as they require two different heavy chains, and two different light chains. “Proper assembly of heavy and light chains has been one of the biggest technical hurdles in developing therapeutic bispecifics,” comments Paul Carter, Ph.D., senior director and senior staff scientist, antibody engineering, Genentech. “Co-expression of two different antibodies in the same cell can lead to up to nine different chain pairings in addition to the desired bispecifics. Besides enabling the heterodimerization of heavy chains, the knobs-into-holes technology can be used to achieve the correct association of the light chains and their cognate heavy chains by exchange of heavy-chain and light-chain domains within the antigen binding fragment (Fab) of one half of the bsAb. Genentech scientists recently reported the development of novel orthogonal Fab designs and demonstrated that they can be used together with knobs-into-holes mutations for efficient single-cell production of bsIgG of different isotypes and species (including human IgG1, IgG2, and IgG4, as well as reverse chimeric IgG2a). Additionally, these scientists demonstrated that their designs can be used for efficient single-cell production of bsIgG in stable CHO cell lines, concluding that these single-cell-bispecific IgG designs may be broadly applicable for applications in biotechnology. Dr. Carter further noted that Genentech is currently evaluating an investigational bslgG, mosunetuzumab, in a Phase I/Ib dose-escalation study. In this study, mosunetuzumab is being administered as a single agent and in combination with atezolizumab in participants with relapsed or refractory B-cell non-Hodgkin lymphoma and chronic lymphocytic leukemia. 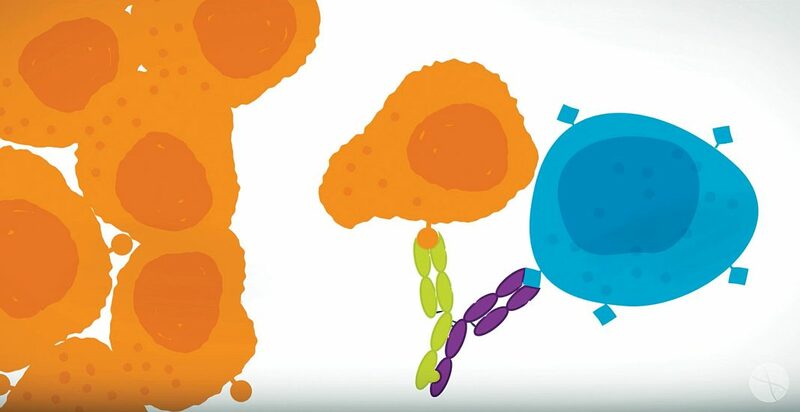 Mosunetuzumab was designed to engage T cells and redirect their cytotoxic activity to a component of the T-cell receptor complex, and to CD20, a B-cell surface protein expressed in a majority of B-cell malignancies. Bassil Dahiyat, Ph.D., Xencor’s president and CEO, spoke with GEN about how the company’s XmAb Fc platform may overcome specific challenges in bsAb production and enable construction of more fully functional antibodies. “The ability to bind two targets creates a vastly greater number of new therapeutics,” he says. “By engaging two targets you can open a world of possibilities. “We used structure-based design to try to get at the property we want, in this case heterodimer structure in the Fc domain, to enable bispecific antibodies with Fcs,” he continues. “We characterized the molecules we got by screening for specific characteristics like receptor binding and stability in our design. Xencor reported in July 2018 that it had dosed the first patient in Phase I study of its XmAb 20717 bispecific (PD-1 x CTLA-4), a dual checkpoint inhibitor, for the treatment of advanced solid tumors. The company has three additional bsAbs in Phase I development: XmAb 14045 (anti-CD123 x anti-CD3) for acute myeloid leukemia and XmAb 13676 (CD20 x CD3) for hematologic malignancies (ex-U.S. rights for both have been licensed to Novartis), and XmAb 18087 (SSTR2 x CD3) for the treatment of neuroendocrine tumors and gastrointestinal stromal tumors. More preclinical-stage bispecific programs are in development by Xencor and with partners Amgen and Novartis. A diversity of antibody formats is conducive not only to developmental play, but also to the advancement of bsAb therapeutics to the clinic—so says a pair of researchers based at the University of Stuttgart, Ulrich Brinkmann, Ph.D., and Roland E. Kontermann, Ph.D.
MaxCyte develops and licenses cell engineering technologies to pharmaceutical and biotechnology companies. For example, MaxCyte offers MaxCyte STX, a cell engineering platform that is based on the company’s proprietary Flow Electroporation™ technology. According to MaxCyte, the platform is capable of high-performance delivery of virtually any molecule, to any cell, at any scale. It has the unique ability to transfect primary cells, stem cells, and cell lines with minimal cell disturbance and transfection efficiencies routinely >90% for a variety of cell types. Jim Brady, Ph.D., vice president of technical applications and customer support at MaxCyte, says that several bisipecific companies are using MaxCyte’s electroporation technology, which allows users to “transfect over 20 billion cells.” Using the technology allows customers to make gram quantities of protein with transient expression—and to do so faster than is possible with long-term culture.